My work is very different from traditional art work. How do you paint a land claim? You can’t carve a totem pole that has a beer bottle on it . . . I paint this for what it is – a very toxic land base. This is what my ancestral motherland is becoming. -From National Gallery of Canada notes for the painting Shaman Coming to Fix (above). The Impending Nisga’a Deal. Last Stand. Chump Change. See more on his website, here. Freaky and cool — there’s obviously a very vibrant art scene among Native Americans in the Pacific Northwest. Love the patterns also. Great word, freaky. And you’re right about the patterns. Interesting. A great “statement” Artist, I love Killer Whale, and in as much as they are scary, the men in the suits made me laugh! Yep, killer whale does it for me too. The messages are loud and clear. The dudes in suits kind of scare me, but I especially love the whale has a vision – I do love all the designs and bright colors. I’m getting to the point where I can’t wait to see what you have to say!! Great comment on the dudes in suits. I bet that’s exactly what he intended. 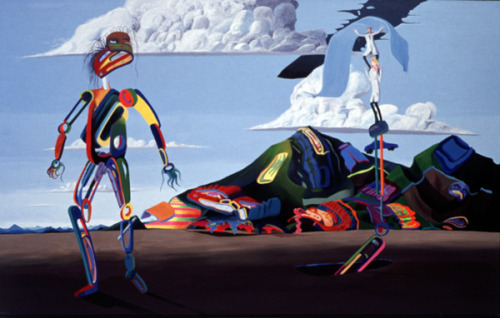 Very interesting take on modern native art, Canada’s answer to Picasso! That’s an interesting comparison. True. The surrealistic underlay is very intriguing.